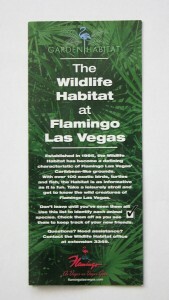 Many people come to Las Vegas with the hopes of experiencing ” The Wild Life”, if just for a few days. 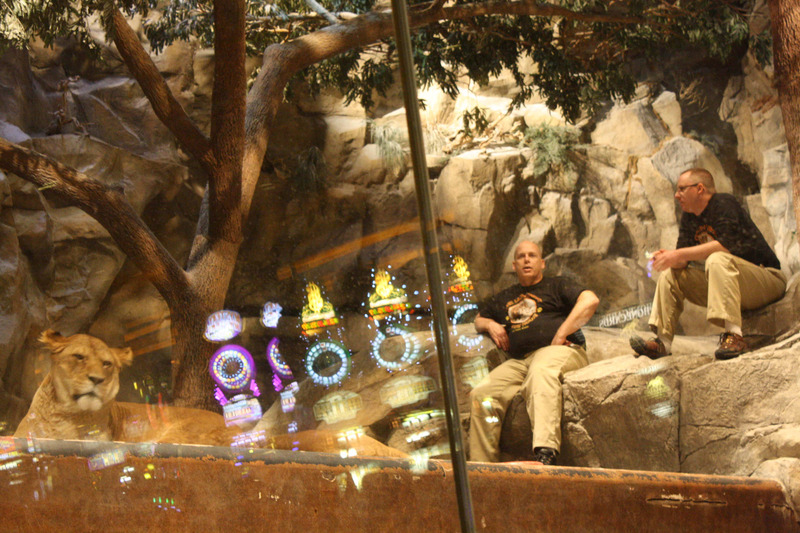 Not too many people come to Las Vegas with “Wildlife” filling their thoughts, perhaps because they believe there is no Wildlife to be found on the Vegas Strip. 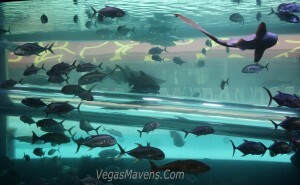 However, there is indeed Wildlife on the Vegas Strip, and that’s what we’re going to explore. The Wildlife Habitat at the Flamingo is adjacent to the tropically themed pool area, the combined area takes up 15 acres of prime real estate . 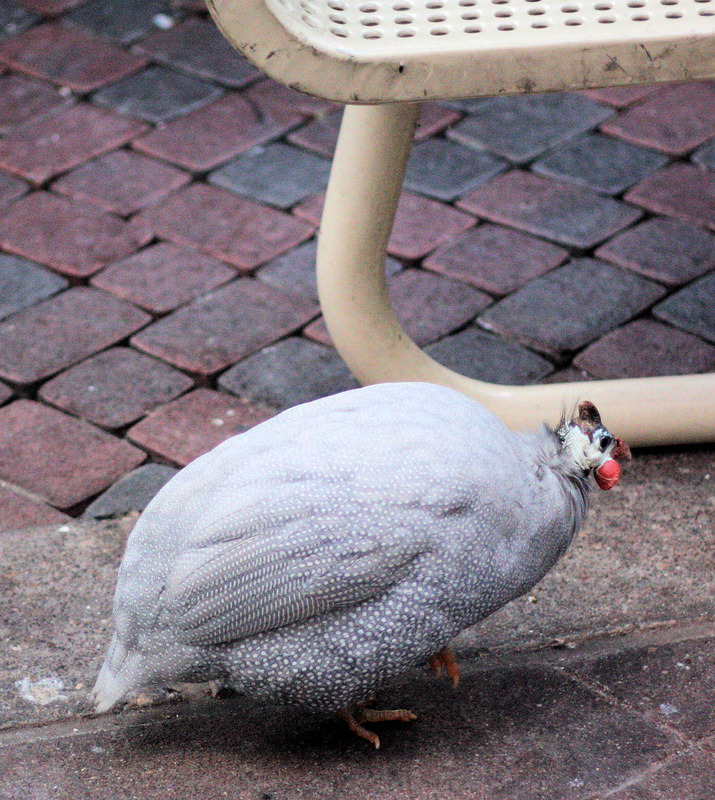 Calling it a “Wildlife Habitat” may be overstating the case, but nonetheless there are an abundant number of critters to investigate. 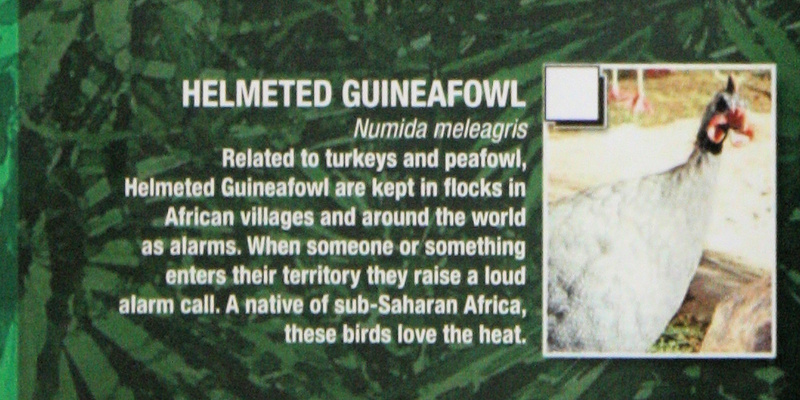 The brochure supplied by the Flamingo claims “…over 100 exotic birds, turtles, and fish…” and then challenges you to find all of them and mark-off the appropriate white box in the brochure. 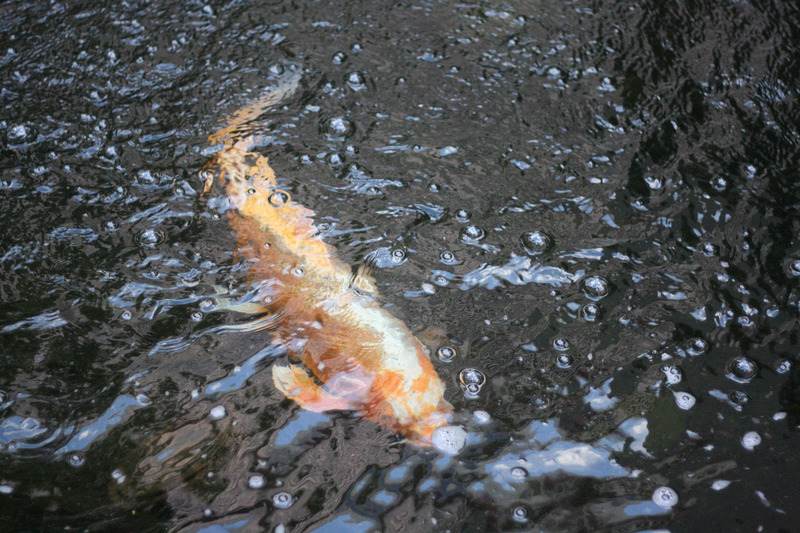 The pond in the Habitat is filled with Japanese Koi, which look like Goldfish on steroids. 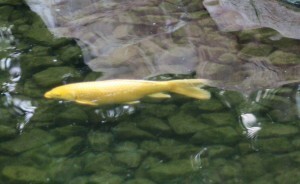 Using the Brochure you can readily distinguish Japanese Koi and Albino Channel Catfish, which look like yellow Koi with whiskers. 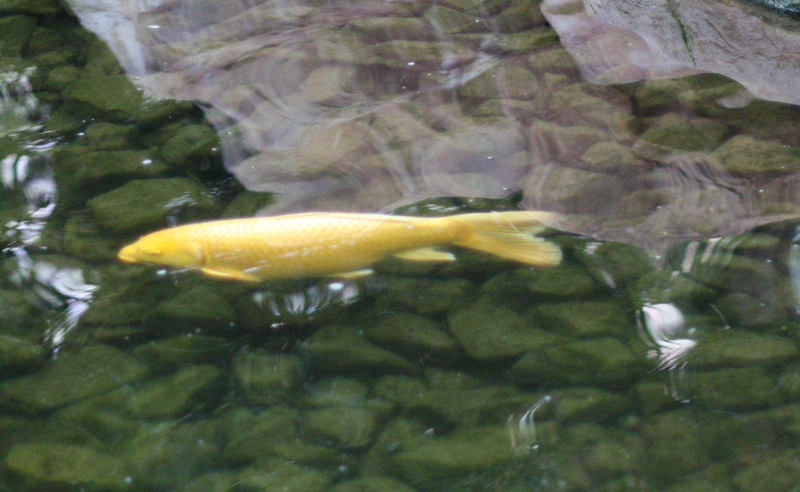 The brochure also includes some interesting facts, such as the listing for Koi which states: Japanese Koi are prized for their colorful and striking patterns— over $1 million was paid for one Koi in Japan by an avid collector. With good care they can reach over 30 pounds and live into their 60s. The longest-living Koi documented, a female named Hanako, lived to be 232 years old, dying in 1987 at a Buddhist monastery in Japan. 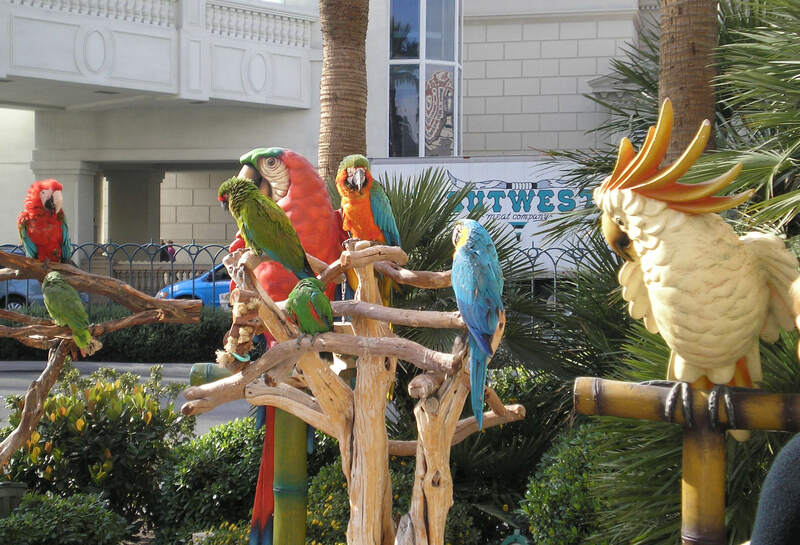 The Flamingo also has a small flock of Parrots, which sometimes hang out on the Strip in front of the Flamingo, beckoning tourists to enter the casino. 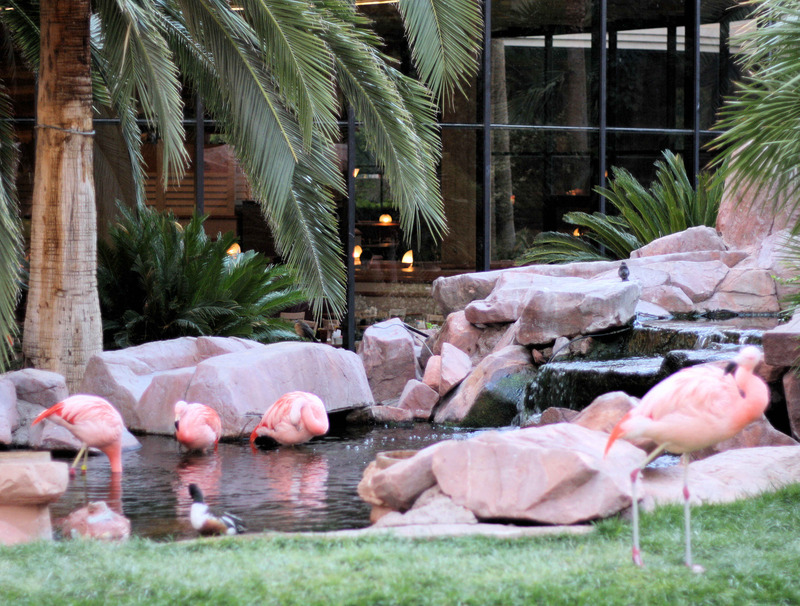 And of course, there are Flamingos, Chilean Flamingos to be precise. 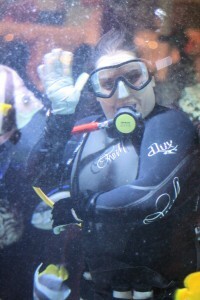 There were Penquins too, but sadly they are no longer at The Flamingo. 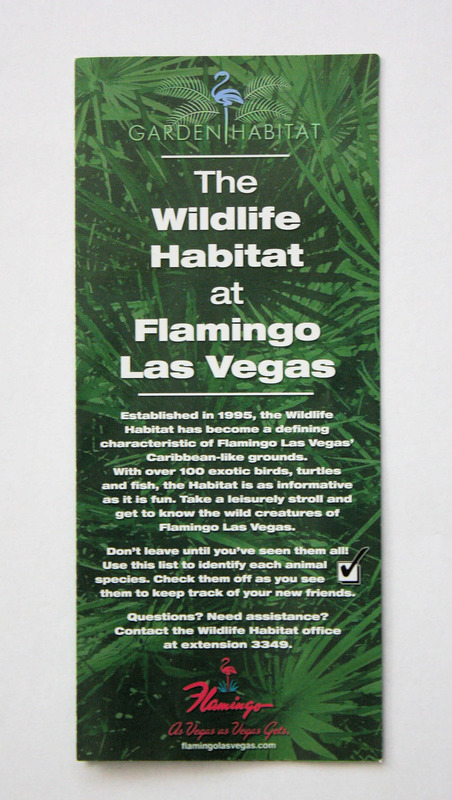 Rumors have it that the Penguins developed a taste for the Vegas Wild Life and ran up a large debt, which they were unable to pay off with their meager salaries from the Flamingo, and were forced to flee Vegas in the middle of the night. 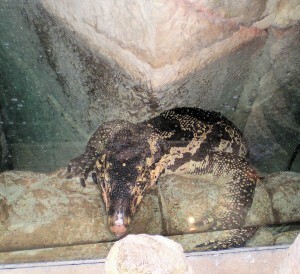 Another rumor is that they moved to a zoo in Texas where they are happily living-out their retirement years. 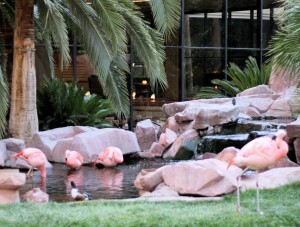 The next stop on the Wildlife Tour is across the street from the Flamingo at the Mirage. 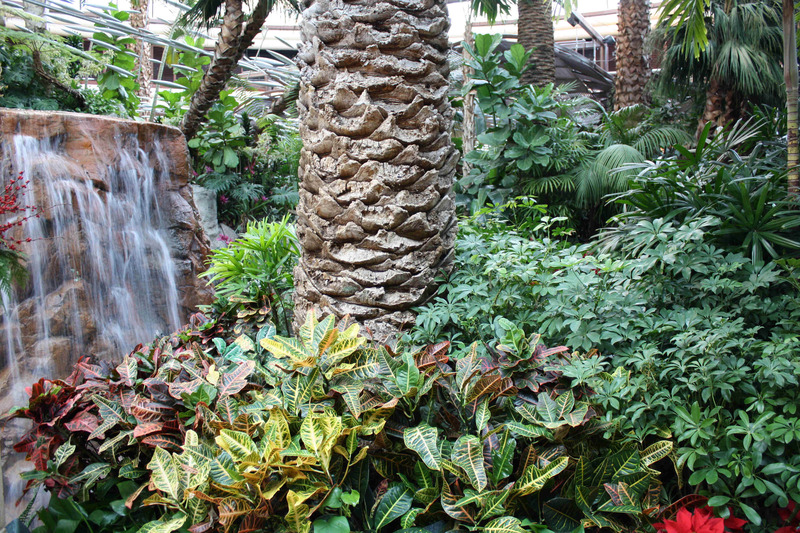 Four full-time gardeners spend over 160 hours each week to maintain the more than 100 different types of plants in the atrium. 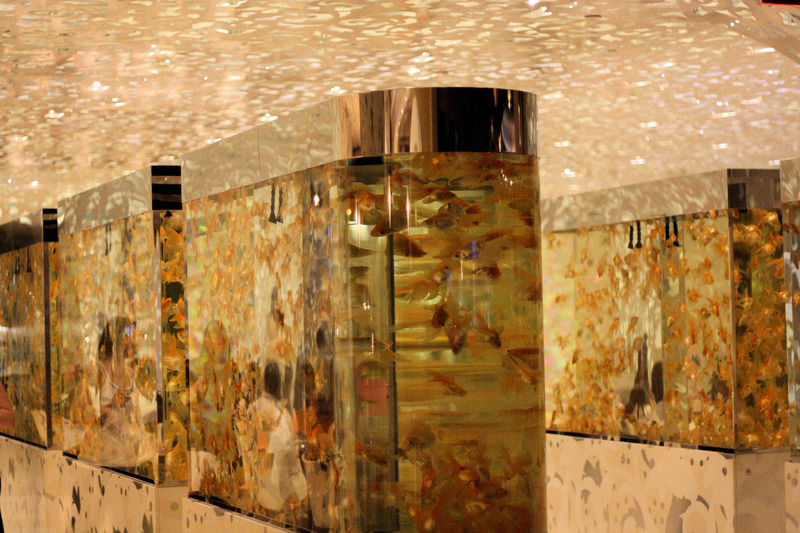 Over 300 fresh orchids and 1000 bromeliads grace the walkways. 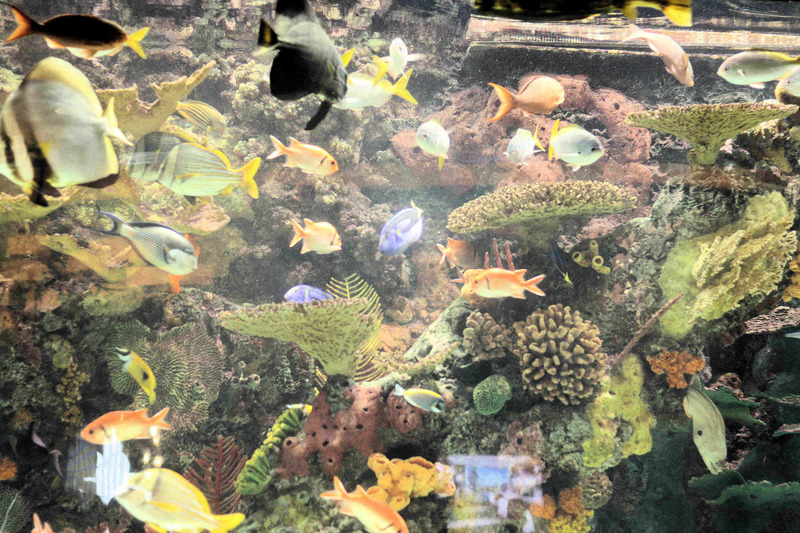 Woven into this waterscape is an artist’s palette of beautifully colored, delicately arranged tropical flowers basking in natural sunlight. Water mists the area lightly throughout the day to enhance the atmosphere and keep the plants cool. 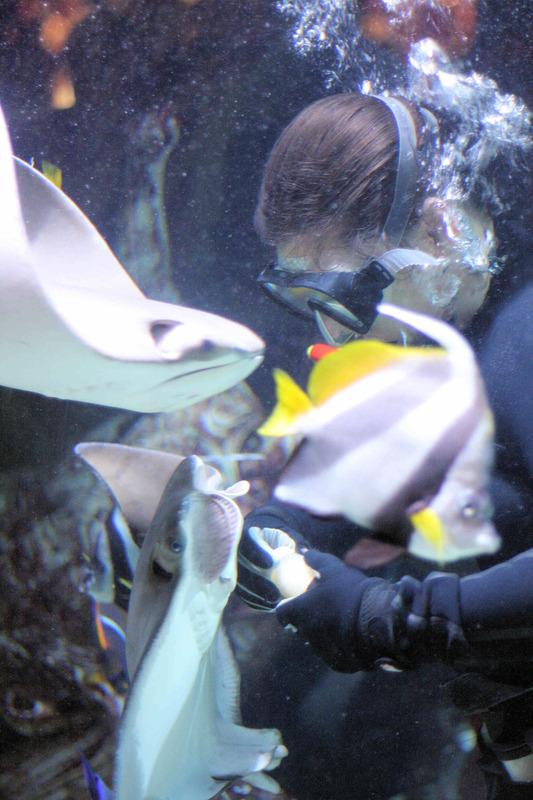 Managed by The Mirage’s own in-house aquarists, the aquarium accommodates more than 1,000 coral reef animals representing 60 species from Australia, Hawaii, Tonga, Fiji, the Red Sea, the Marshall Islands, the Sea of Cortez and the Caribbean. 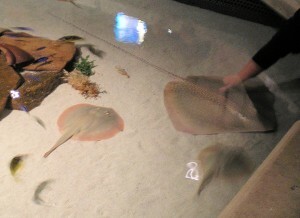 These sea animals were all selected for their adaptability to the environment and compatibility with other species. One of the most elaborate and technically advanced aquariums in the world, the tank is 53 feet long, eight feet from top to bottom, and six feet from front to back. 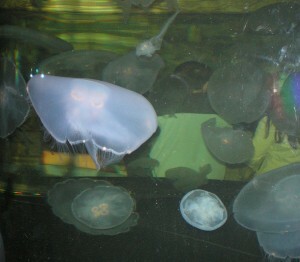 The acrylic used in the aquarium is 4 inches thick. In the back of the Mirage is Siegfried and Roy’s Secret Garden and Dolphin Habitat. 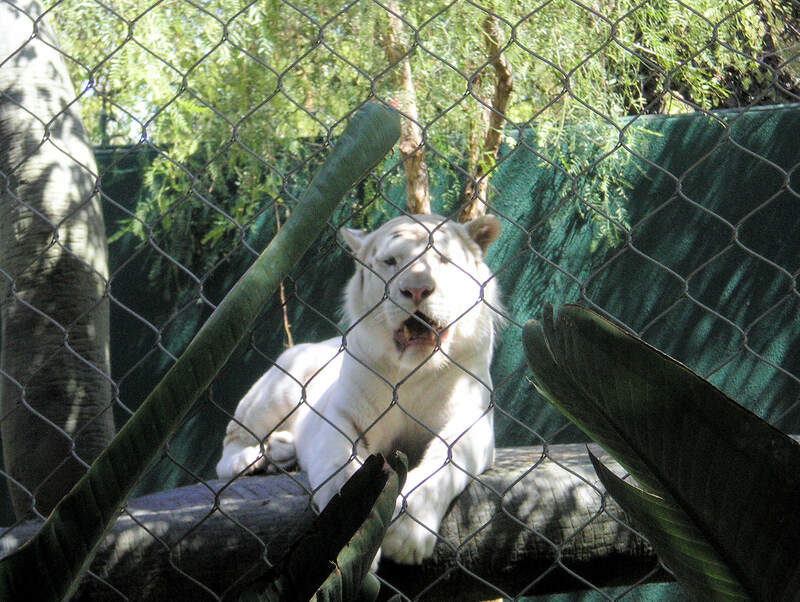 (Note there is a fee to see this attraction $15 adults and $10 Children) The habitat houses the famous, perhaps infamous, white tigers, plus panthers, leopards, lions, alpacas, in separate areas, of course. 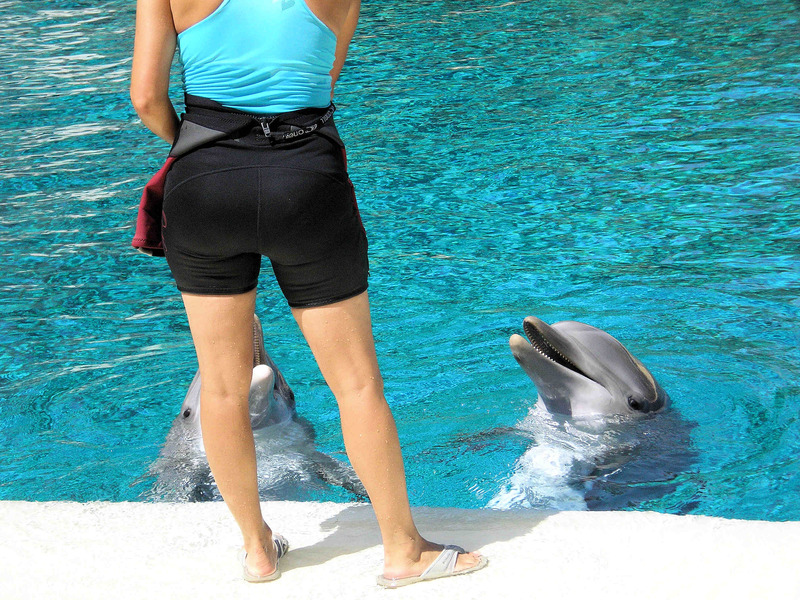 The Dolphin Habitat has 2.5 million gallons of salt water. 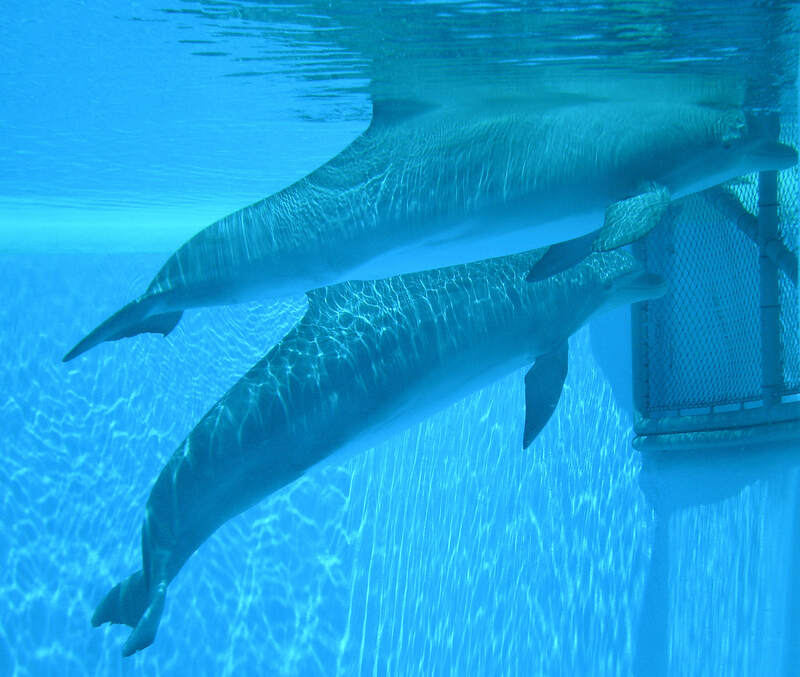 There is an below ground level viewing deck, where you can watch the dolphins swim underwater. The next stop on our Wildlife Tour is next door to the Mirage at Caesars Palace. In the Forum Shops, in front of The Cheesecake Factory, where the Fall of Atlantis animatronic show takes place on the hour, there is a 50,000-gallon saltwater aquarium. 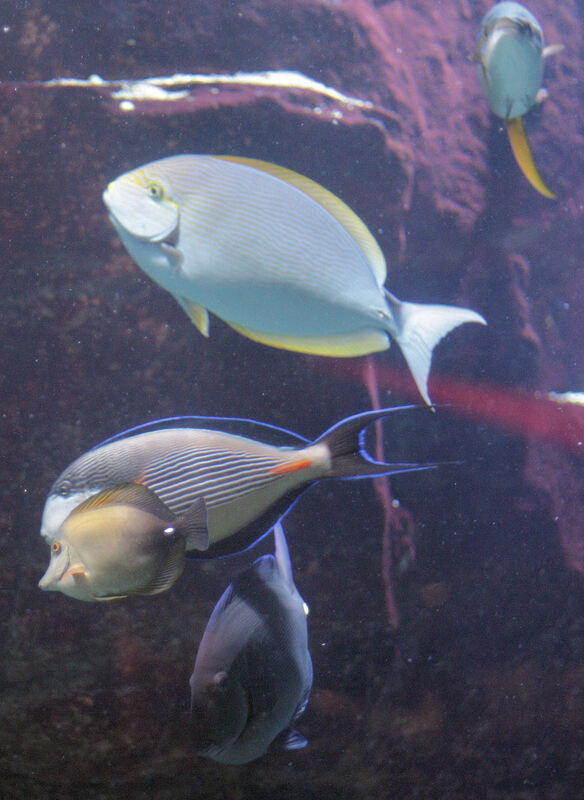 The aquarium is filled with sharks, stingrays, puffer fish, and a whole slew of other tropical fish, over 500 at last count. 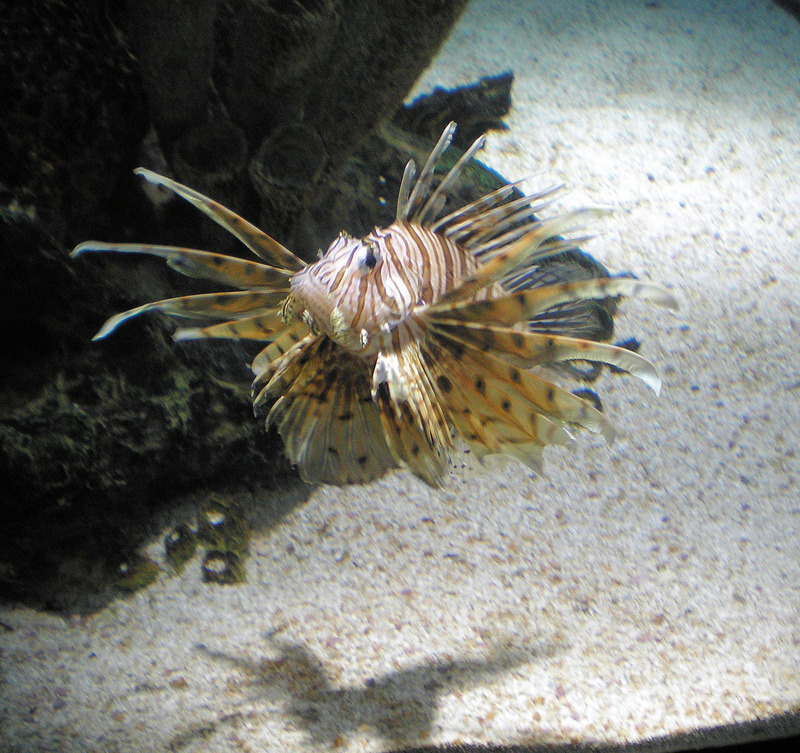 You can watch divers feed the fish everyday at 1:15 pm and 5:15 pm a well informed staff person is present during the feeding to answer any questions you may have. 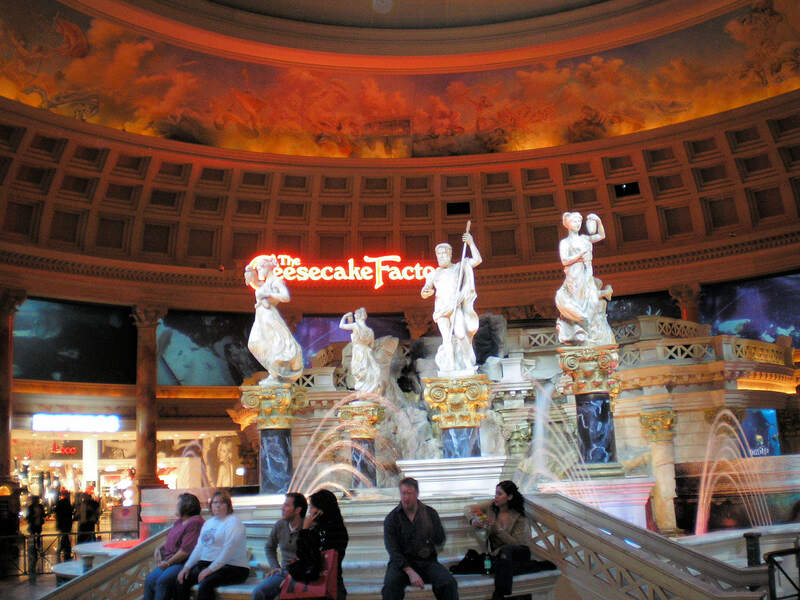 There are two other places. that I know of, with interesting aquariums at Caesars Palace. 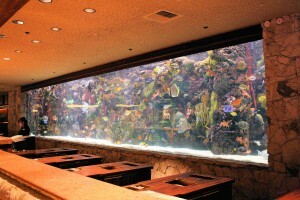 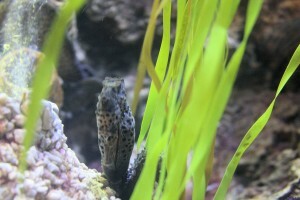 The first is the Seahorse Lounge, which as might expect, has an 1,700 gallon aquarium filled with Seahorses. You have to really search for the seahorses, because they tend to blend into the background, plus they tend to remain rather stationary. 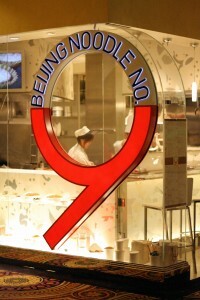 The second place is Beijing Noodle No. 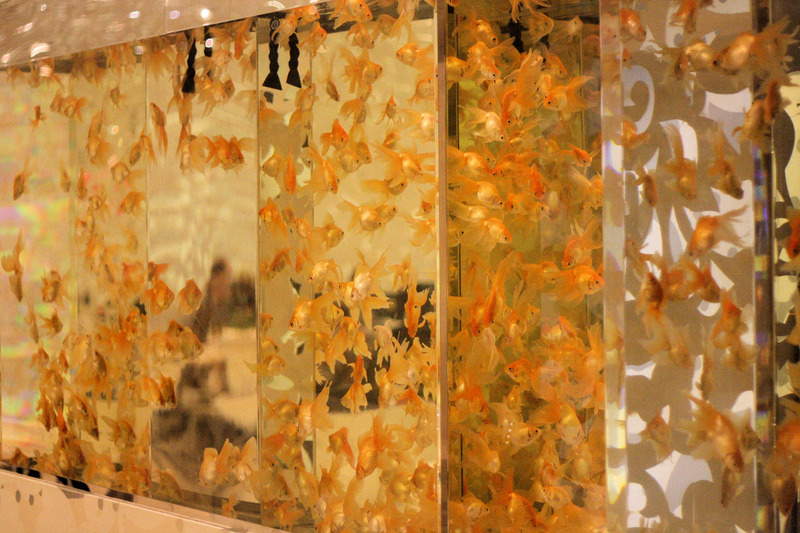 9, the whole entrance way is flanked by large aquariums filled with goldfish. 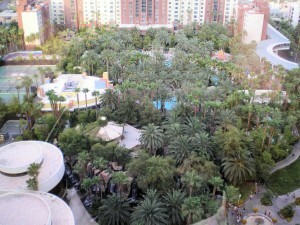 Our next Stop on our Wildlife Tour is Mandalay Bay, however, en route the Botanical Gardens at Bellagio are worth a look. 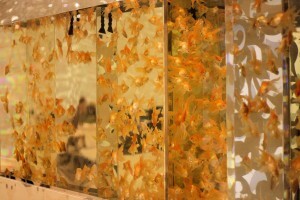 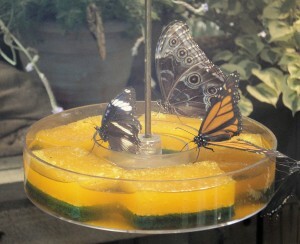 Plus, they sometimes include critters and such in their displays, such as these butterflies in this Spring display. 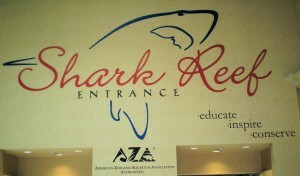 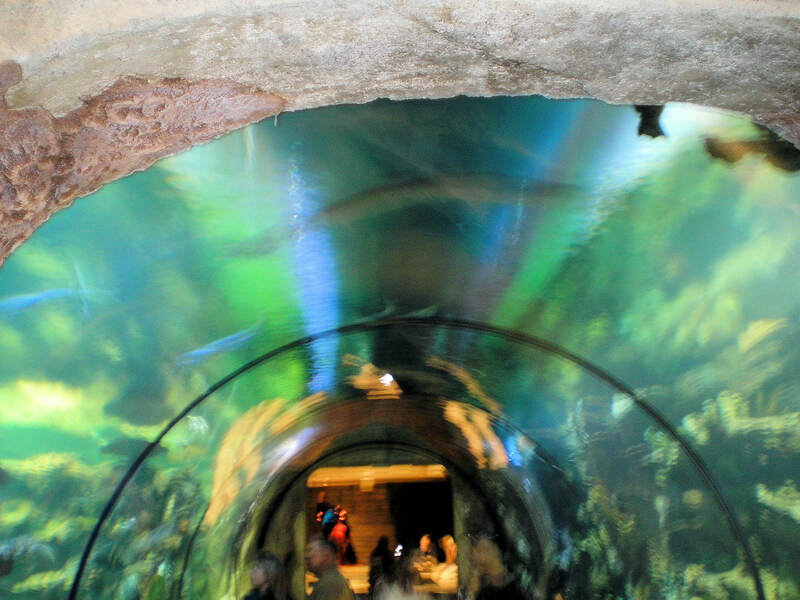 The most dramatic aspect of the Shark Reef display is the tunnel that lets you walk through the display, Sharks literally swim around you. 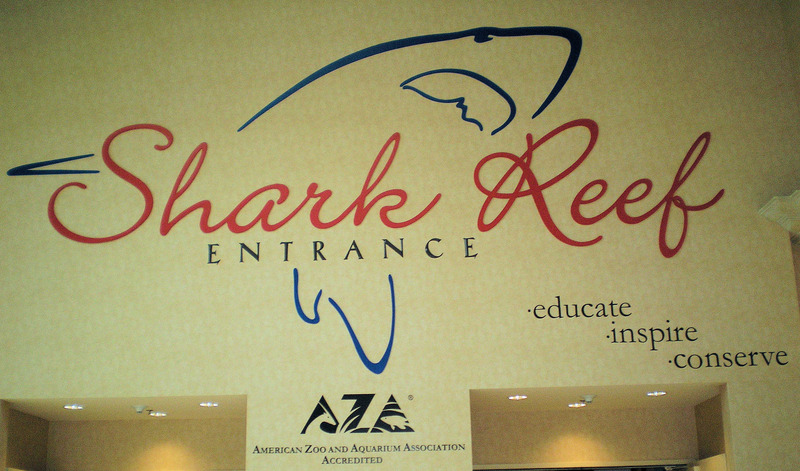 Our final stop on our Wildlife Tour is at the MGM Grand. 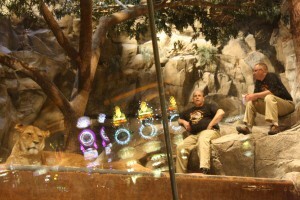 The MGM Grand has a Lion Exhibit. 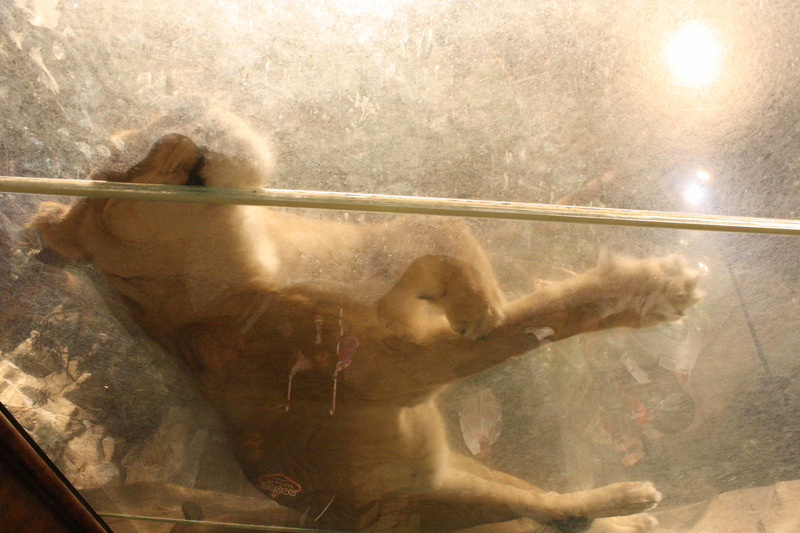 The lions on display are actual descendants of the the MGM Studio lion that roars at the beginning of MGM movies. The lions are present from 11am-7pm daily. The pride of Lions actually live on a ranch 12 miles from the Strip. 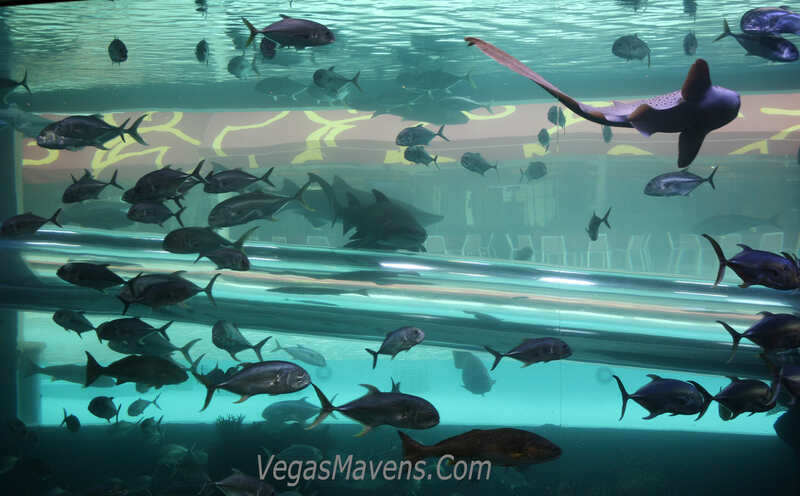 This concludes our tour of Wildlife on the Las Vegas Strip, however if you head down to Fremont Street, you should include the pool at the Golden Nugget on your Tour.